Mardi Gras. How to explain the world's biggest party? If you were born in New Orleans it's just the way things are. 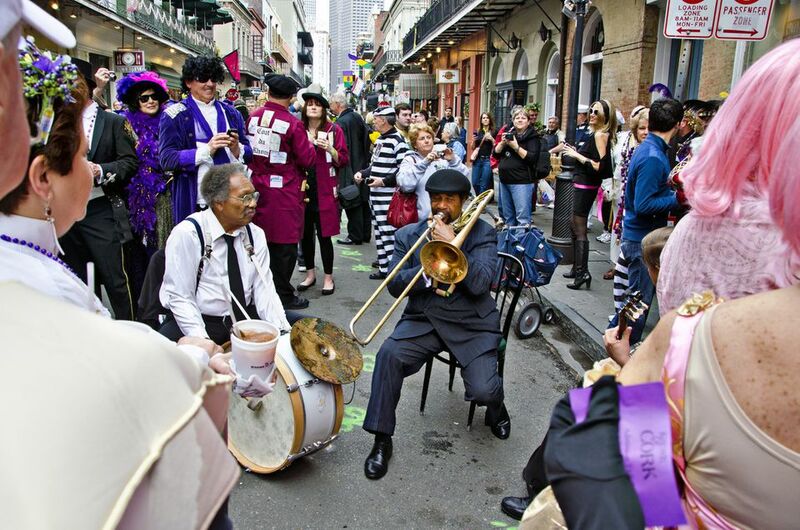 It's in your bones, and you can't imagine living anywhere that doesn't celebrate Mardi Gras. However, if you're a visitor, you might need some explanation and guidance. So, to begin, Mardi Gras is French for "Fat Tuesday." It is always celebrated the day before Ash Wednesday, so the date changes every year. Ash Wednesday is the beginning of Lent, and for New Orleans's Catholics, that means sacrifice, so Mardi Gras is the last bash before Lent. But this is New Orleans, and one day of partying is simply not enough. Technically the season of Mardi Gras, called Carnival, begins on January 6th, the Feast of the Epiphany. On January 6th, the Carnival season begins with balls, which are elaborate, by-invitation-only, formal tableaus in which the royalty of the individual group or "krewe" is presented. Then about two weeks before Mardi Gras day, the parades begin. Krewes are the private clubs that put on Mardi Gras and related events of Carnival. The expenses of this monumental party are paid by the individual members of the Krewes, and there is no commercial sponsorship for Mardi Gras parades. The Mardi Gras Parades start about two weeks before the actual date of Mardi Gras. There are several types of parades. Some are put on by "old line" Krewes, the traditionalists who have the tableau balls, and a king and queen elected from within the Krewe. These Krewes go back to the 1800s, and they are credit for establishing the Mardi Gras traditions still occurring today in New Orleans. The Krewe of Rex presents the oldest of these parades and dates back to 1872. Rex parades on Mardi Gras day, and the King of Rex is the official King of Carnival. The parades put on by the more recently founded "Super Krewes" are much larger in scale. The floats are often several times the size of the floats in the old line parades. In lieu of balls, the Super Krewes have lavish parties immediately after their parades and feature celebrity kings. The Super Krewe parades start the Saturday before Mardi Gras with Endymion. The next night is Bacchus. Both founded in the 1960s, Bacchus and Endymion are the "granddaddies" of the Super Krewes. The day before Mardi Gras is known as Lundi Gras (Fat Monday). The newest of the Super Krewes, Orpheus parades the night of Lundi Gras. Almost all of the New Orleans parades travel down St. Charles Avenue and into the Central Business District. The one notable exception is Endymion, which travels into the Central Business District from Canal Street. Very few parades actually go into the French Quarter because of the narrow streets in this old, historic section of town. If you want to see a parade, you have to leave the French Quarter, or at least go to Canal Street at the edge of the French Quarter. One thing all Mardi Gras parades have in common are that the riders throw things to the crowd. Of course, the main items are the Mardi Gras beads. But they also throw plastic cups and doubloons (coins) with the date and the krewe's theme for the year. Some of the parades have throws that are unique to the krewe. For instance, the riders of krewe of Zulu make hand painted and beautifully decorated coconuts. Although city law makes it illegal to throw these, the riders are allowed to hand one to you. A Zulu coconut is probably the highest prized throw in Mardi Gras and if you're lucky enough to get one you get bragging rights. Contrary to popular belief, Mardi Gras is family-friendly. Most New Orleans families are on St. Charles Avenue somewhere between Napoleon Avenue and Lee Circle. If you go into this area, you will find family picnics and barbecues all along the parade route. Smaller children are perched on special seats bolted onto ladders to make sure they're safe and able to see what's going on. By law, these ladders must be as far back from the curb as they are high, and an adult must stand on the ladder with the child. Float riders carry special throws, like stuffed animals, for the small children along this part of the parade route. Because this area is traditionally a family area, the mood is friendly and G-rated. No matter what goes on during the carnival season and specifically on Mardi Gras day on Bourbon Street, it all ends exactly at midnight. At the stroke of midnight, Lent starts and the party ends. Mounted police leading a parade of large street cleaners clear Bourbon Street. So, it's best to be off Bourbon Street before midnight. Many newcomers to Mardi Gras either don't know this or don't believe it and get caught up in the fray. Believe it, the party ends at midnight. So, come to Mardi Gras and don't be afraid to have a good time. Remember, you can come alone and see the sites on Bourbon Street, or bring the kids and stay on St. Charles Avenue.